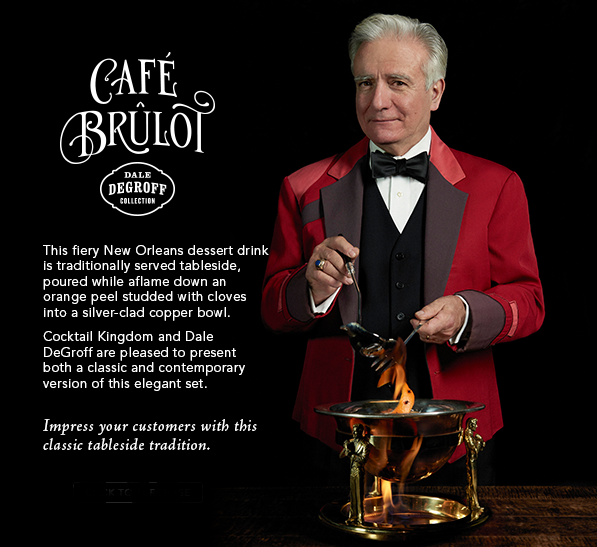 The ultimate tribute to King Cocktail himself, this stunning Café Brûlot set will impress anyone who enjoys an after dinner coffee with a kick. Preparations call for an orange peel cut precisely as one long, intact spiral; a lemon peel cut into strips; sugar, cloves and cinnamon; cognac or brandy and hot, strong black coffee. Most importantly, the drink requires fire. First made at Antoine’s Restaurant in New Orleans, it is credited to Jules Alciatore, son of founder and namesake Antoine Alciatore, sometime in the 1890s. Bring it back into the 21st century!